RESTON, Va., Oct. 01, 2018 (GLOBE NEWSWIRE) — Overall, demand for graduate management education is stable in 2018 compared with 2017 according to findings of the annual Application Trends Survey from the Graduate Management Admission Council. Applications to business school programs in the Asia-Pacific, European, and Canadian markets are up over 2017 while programs in the United States report a drop in volume. Across graduate business school program types—including MBA, business master’s, and PhD programs—most programs in Asia-Pacific, Canada and Europe received more applications than last year. Growth in the Canadian and European regions derive largely from increases in international applications, while domestic growth is fueling increases in Asia-Pacific. Regionally, strong growth in application volume across all program types was offset by declines in the United States. Programs in Asia-Pacific had an 8.9% increase, Canada realized 7.7% growth, and Europe had a 3.2% increase in application demand across all program types. The United States experienced a nearly 7% decline, including a 1.8% decline in domestic application volume and a 10.5% drop in international volume across all program types. The ability to attract top international talent continues to be a critical determinant to programs’ overall application volumes. This year, 65 percent of Canadian programs and 63 percent of European programs report an increase in international applications over 2017. The majority of applications received by Canadian and European programs this year are from international applicants. Most programs in the United States report declining demand as non-U.S. students continue to identify attractive educational and professional opportunities elsewhere. Application volumes from domestic candidates are also soft this year for U.S. programs, with only 4 in 10 reporting growth in domestic application volume. Full-time, two-year MBA programs are still the most in-demand program type. Overall, MBA and business master’s programs report a similar volume of applications in 2018 compared with last year. The majority of European Master in Management and Master of Finance programs report growth in demand. A bright spot for U.S. programs are Master of Data Analytics programs, most of which report application volume growth this year. 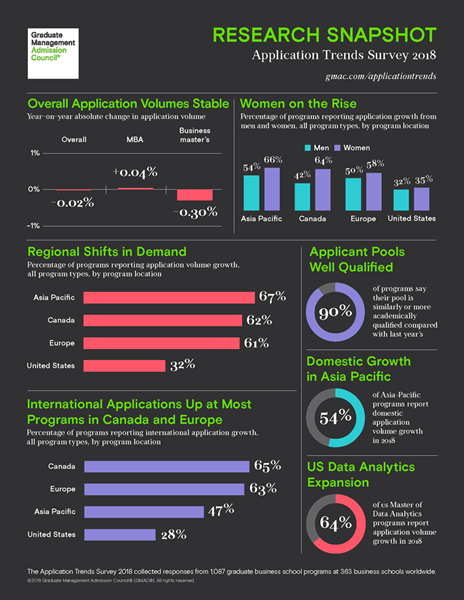 Counter to the overall trend, more US Master of Data Analytics programs report international application growth than domestic application growth in 2018. GMAC conducted its 19th annual Application Trends Survey from early June to mid-July 2018. The survey findings are based on responses from 1,087 graduate business programs at 363 universities worldwide. Participating programs are located in 44 countries, including 43 states and the District of Columbia. Participating programs, which include MBA, business master’s, and doctoral-level programs, received a combined total of 466,112 applications during the 2018 application cycle. Nine in 10 participating programs report that the applicants this year are similarly or more academically qualified than candidates last year. The Graduate Management Admission Council (GMAC) is a non-profit association of leading graduate business schools worldwide. Founded in 1953, we are committed to creating solutions for business schools and candidates to better discover, evaluate and connect with each other. We work on behalf of the schools and the graduate management education community, as well as guide candidates on their journey to higher education, to ensure that no talent goes undiscovered.